Setting up home after a move is not an easy task considering all the troubles you’ve been through during the relocation process. The truth is that you will need to invest a lot of effort, time and energy before you completely settle into your new home. There are a lot of tasks and activities to take on after the NYC movers leave your house. Getting organized after the move is one of the most important post-moving tasks. Standing in the middle of all those moving boxes waiting to be unpacked can be a bit discouraging, since at first you may not have a clear idea where to start. After you’ve taken care of hundreds of moving-related tasks, you may feel like you’ve had enough of packing, moving and cleaning. Once you reach your new home, you will probably be very tired. The good news is that by taking several simple steps you will make the unpacking easy on yourself. – Have your essentials box handy. That way you won’t have to spend hours looking for clean towels or pajamas immediately after you arrive at your new place. Also, a series of moving-related tasks that you needed to complete throughout the process made you feel tired and exhausted, so the only wise decision is to take a relaxing shower, make your bed and have a nice sleep in case you reach your new home late at night. Although a successful household relocation is all about perfect organization and consistency, you don’t need to rush to unpack each box the same day you arrive. – Try to minimize the stress of unpacking as much as possible. If you need to unpack quickly, make sure you get helpers. Full-service moving services usually include unpacking as well, so not only your movers will place each box where it belongs, but also they will unpack them and reassemble all household items. However, bare in mind that unpacking is a demanding and time-consuming task and it may take longer that you’ve expected. If you are starting a new job in a few days and you don’t have enough time to unpack everything and settle into your new home, hiring professional packers will be the most convenient solution. – In order to speed up the unpacking process, make sure your new home is clean and tidy. – Which room to unpack first is one of the most common concerns when it comes to organizing your new home after the move. Rooms should be unpacked according to the occupational significance. The best approach would be to unpack the most important rooms little by little. You would probably agree that there’s no point in unpacking and arranging the whole kitchen immediately and leaving bathroom and bedrooms completely unpacked. – Reorganize and declutter. In case you didn’t get rid of all unnecessary items before the move, you are likely to bump into some belongings that you would like to discard or store. 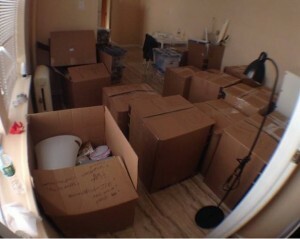 – First unpack large and heavy pieces of furniture and appliances and plan in advance where each item should be placed. An efficient floor plan will save you a lot of time and energy during the unpacking process. – Gather used unpacking supplies and dispose of them properly, in an environmentally-friendly manner if possible. Choose to recycle in order to perform a responsible, green household move. – The sooner you unpack, the more time you will have at your disposal to adjust and settle into your home. There’s no need to rush, but constant procrastination will lead to an even bigger issue. Remember that it may take some time for you to make your new place feel like home and by putting the finishing touches on your household project, you will make a pleasant and comfortable environment for you and your family.